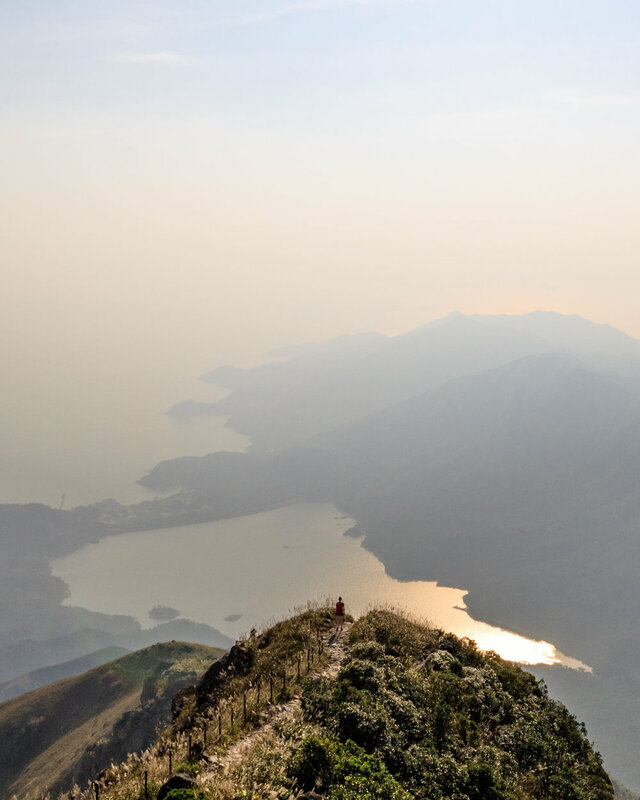 There are few walks in Hong Kong that will knock you for six quite like Lantau Peak. If the incredibly steep incline doesn't take your breath away, then the views all along this picturesque trail will. So here's our guide to heading out of the city and tackling one of the most rewarding trails in Hong Kong. Getting there: The best place is to start at Tung Chung. From there you have two options: grab a blue taxi to Pak Kung Au down the Tung Chung Road (red taxis can't go here), or catch a local bus. Difficulty: Hard. The start is pure incline, very steep over a very short distance. However, the trail from the summit to Ngong Ping is all down hill with some flat sections. Path: The path is very well defined. The majority of the trail is across nicely cut stairs, so you don't need to worry about slipping or climbing over rocks. Water - The key to this hike is carrying a good lot of water. The trail is virtually all exposed and it's hot most of the year round. Poles - You may want to consider taking walking poles to take some of the strain off your knees on the descent, but it's not essential. Which route - You can start this trail at Tian Tan Buddha in Ngong Ping, but our suggestion is to start from Pak Kung Au. This route is a little less steep (600m over 4km, rather than 2km), has drinks stands at the end and you can return to Tung Chung more easily as you can simply take the cable car or a local bus back down. If you were to finish at Pak Kung Au, you'll be waiting a while for a bus. Plenty of time - It's worth giving yourself a good amount of time if you are finishing at the Big Buddha to take in the views and see the buddha statue itself as well. We started at 2pm, but would have ideally started before midday to have a good amount of day light to take it all in. The trail starts at the side of Tung Chung road by a bus stop. The path starts going up hill almost parallel to the road (don't take the South Lantau Country trail at the end of the picnic area). Get ready as the incline starts immediately with stairs taking you up the first ridge. For the next 4km you're won't receive any respite, as it's almost all completely upwards. The beginning is reasonably shaded, but it doesn't last too long before you're on an open ridge. It won't be long before you can look back to see where you started from and you'll be pleased that the road already looks significantly lower down. Soon the trail continues over several ridges and the false summits start. In our breathless state, we hoped the next 3 peaks were all Lantau Peak, but there was always a taller one up ahead! Whilst hiking, ensure you give yourself plenty of time to look back and admire the view. It's an incredible vista of the surrounding peaks, beaches and ocean. This is all a contrast to the hustle and bustle of the airport in the other direction. Continuing upwards once more you'll come across a couple of small flat sections with seating if needed to take in some more of the view. By now our legs were struggling and we were stopping every 5 minutes to catch our breath and to maintain the motivation to keep pushing on. By kilometer 4 we were down to an average pace of 2 kilometers per hour! After 4km and 586m of incline, you'll be at the top. The peak is 934m above sea level and offers 360 views of Lantau Island and the South China Sea. It's hard not to be blown away by one of the best views in Hong Kong. It made our list of most instgrammable places in Hong Kong. There's some pretty cool cliff edges for photos and a covered hut if you end up here in inclement weather - though we wouldn't recommend this walk in the rain, it could easily become extremely slippery which would be dangerous on the steep ridges. You'll also get your first glimpse of Tian Tan Buddha and the finishing post in the distance. In the afternoon this is bathed in a glorious golden light. After the break at the top, the prospect of a hike downhill seemed tantalising. However, you soon realise that the gradient at the otherside of Lantau Peak is steeper than the Pak Kung Au side. It's worth taking your time on this part. Even though the path is very well defined and stable, it's also quite a steep drop on tired legs. 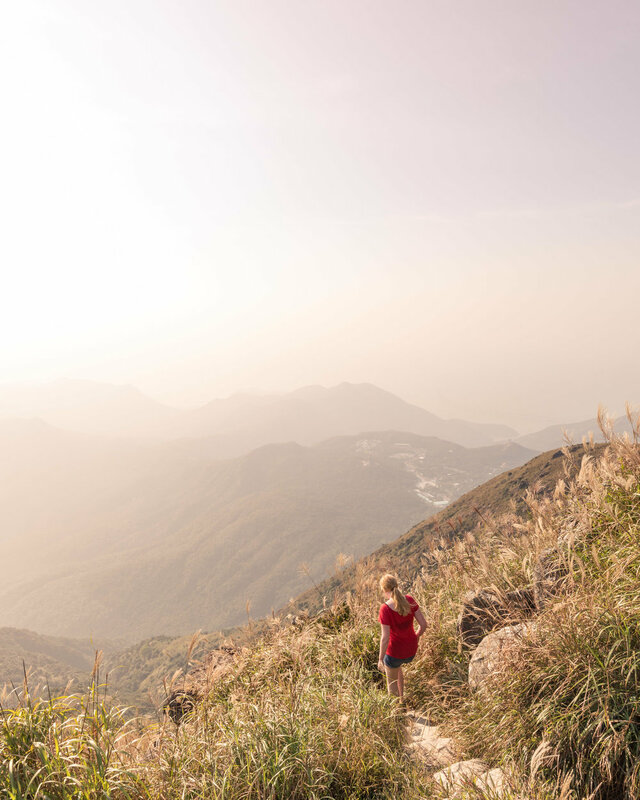 The views of the surrounding valleys will continue to impress as you drop down from Lantau Peak in the golden afternoon light. It felt a real privilege to see more of the rural beauty of Hong Kong. It's an amazing contrast from Kowloon and the bustle of the city that's very nearby. The air is clear and you're surrounded by lush countryside and big blue skies. When we heard the traditional Chinese Music playing in the distance, we found it hard to believe we were in one of the most densely populated parts of Asia. The trail down has a couple of flat sections, but for the most it's almost completely downhill. Eventually you'll come to the entrance of the Wisdom Path where the tourists reappear, wondering how you could possibly get so sweaty and disheveled. The descent was definitely much easier than the ascent on all but your knees. The hike finishes at the Tian Tan Buddha, something we'd seen many times in books and on television and it was a fitting end to the hike. The buddha has a pretty incredible view and sits presiding over the the surrounding area. The 268 steps to the top were not overly welcome at this point but were definitely worth it. Towards sunset, the crowds have thinned and you can comfortably wander around and there's also a few stalls where you can get a well earned cold drink. We're not usually ones for touristy things, but the cable car is well worth the price (which is a staggering HK$145 per person, one way). It's about 20 minutes long and offers further spectacular views of Lantau Island, conveniently finishing at Tung Chung MTR. Even at 6pm the queue was half an hour long, but our exhausted legs were grateful that we didn't have to walk all the way down. Incidentally another time we would love to do the hike either up to or down from the buddha as we've heard it's incredibly beautiful. If you don't want to shell out on the cable car this could be a much better option than taking the bus. Lantau Peak is certainly not for people wanting a leisurely stroll, but those who put the effort in will be rewarded. It was our favourite hike in Hong Kong as you'll see some of the beautiful scenery this part of the world has to offer. We were pretty out of practice on the hiking front and many locals seemed to find this track a walk in the park so you may find it much easier than us. Let us know! Where we stayed: There's few hotels we've ever been to that are as good as the Ritz Carlton. A trip here is an experience in luxury and is unlike anything else we've ever experienced. If you're happy with getting public transport, then the Hyatt in Sha Tin is another decent option. The rooms are huge, comfortable, but it's further out from the main town. Have you been to Hong Kong? 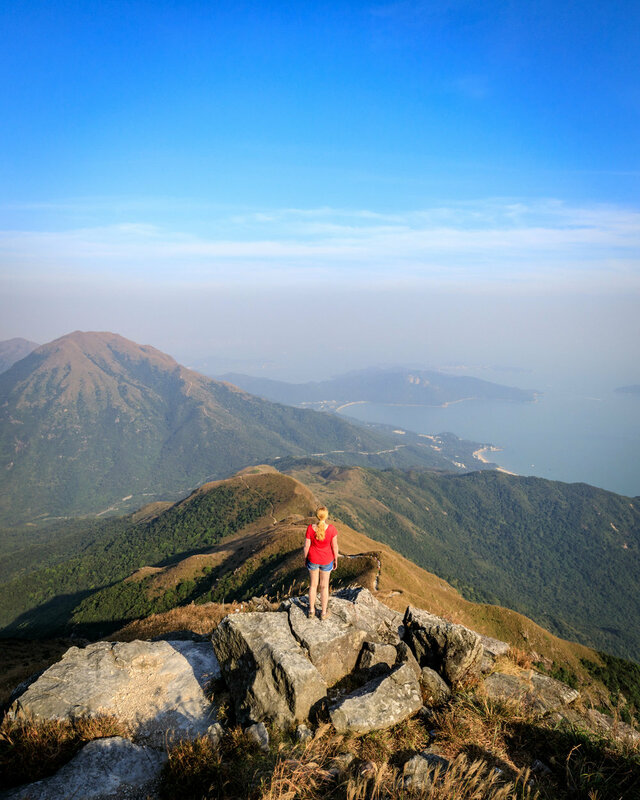 Have you taken on Lantau Peak? Let us know your favourite hike in the comments below.